I don’t know about you guys but I had a pretty great Friday. Not only was it the best day of the week but I also got to celebrate my Betsy’s birthday. Last year we went to Betsy’s place and hung out, played games, and I made these insanely amazing Oreo Bars. This year we celebrated at Comedy Sports in Calhoun Square in Minneapolis. Before I get into that, one brief back track. For dinner I made meatloaf burgers. I mixed lean ground turkey with chopped olives, onion, a dash of garlic powder, and cracked black pepper. I formed them into patties and cooked them on the stove top. I topped mine with mozzarella cheese and served it with sautéed mushrooms. Delicious. Okay, now back to the birthday celebration. We met the birthday group at Republic Bar in Calhoun Square. As someone who doesn’t visit that area very often I have to say I was blown away at how nice it was. Not only Calhoun Square, but Republic as well. I felt like I was in Chicago or New York. I loved the feeling of it. Right across the hallway from the Republic was Comedy Sports. So after a little mingling and libations, we headed across the hall. Comedy Sports is an improvisational comedy show played like a game. There are two teams of three comedians who compete for the most laughs. There is a referee who calls the shots, names the games, and interacts with the audience taking suggestions for objects in the skits. If you’ve ever seen ‘Whose Line is it Anyway?’, then you know exactly what I’m talking about. I thought the show was very funny. I thought they would pick on the birthday girl but they didn’t, and I think she was more than happy about that. Tickets were only $12, actually $11 because we got a group discount. I think that’s quite the deal when you consider that is pretty much the same as going to a movie. Right? I haven’t been to a movie in a good year or two but last I remember it was $10 or so. It is a great way to spend a Friday evening. I can’t decide though if I enjoy improv comedy or stand-up comedy like we saw at the Joke Joint more. They both make me laugh which is a healthy wonderful thing. After dinner we made a stop at one more bar before calling it a night. 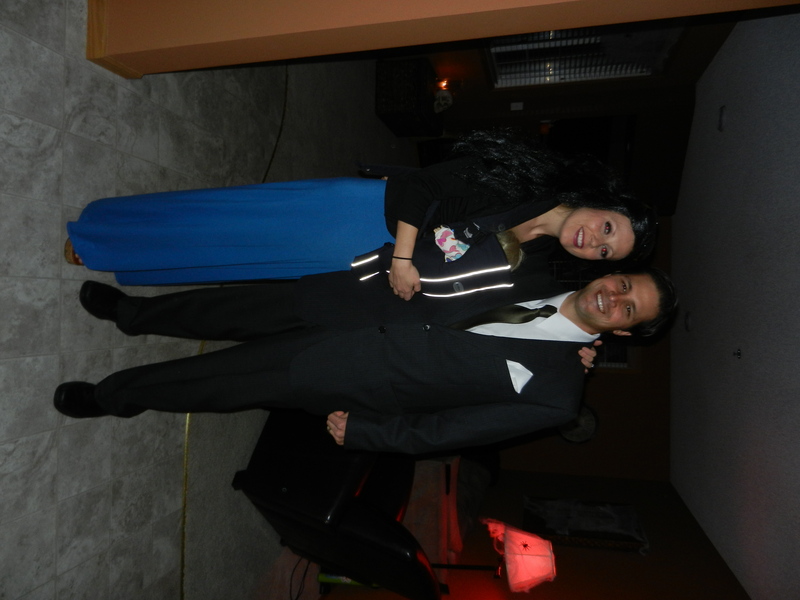 I had so much fun celebrating last night with my little snarky. 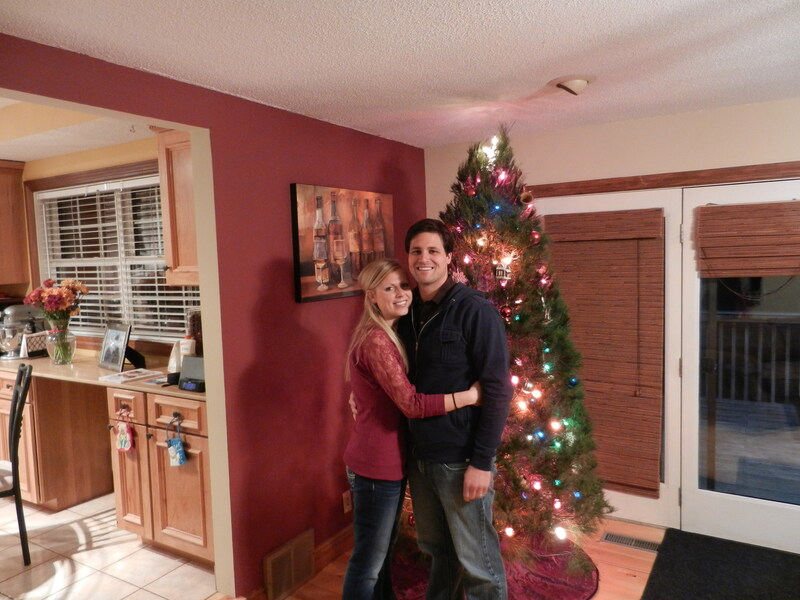 I love that lovely lady more than I could ever say. Enjoy your Saturday my friends. I am off to get a workout in, take down Christmas decorations, and RELAX. Question: Have you ever been to a comedy show? What did you think? Happy Friday! Holy cow this week flew by and I am NOT complaining! I’ve been a busy bee this morning already; I got a quick run in and then ran a couple of errands. I still have a boat load of things on my to-do list today though so I’m not going to get too windy in today’s post. 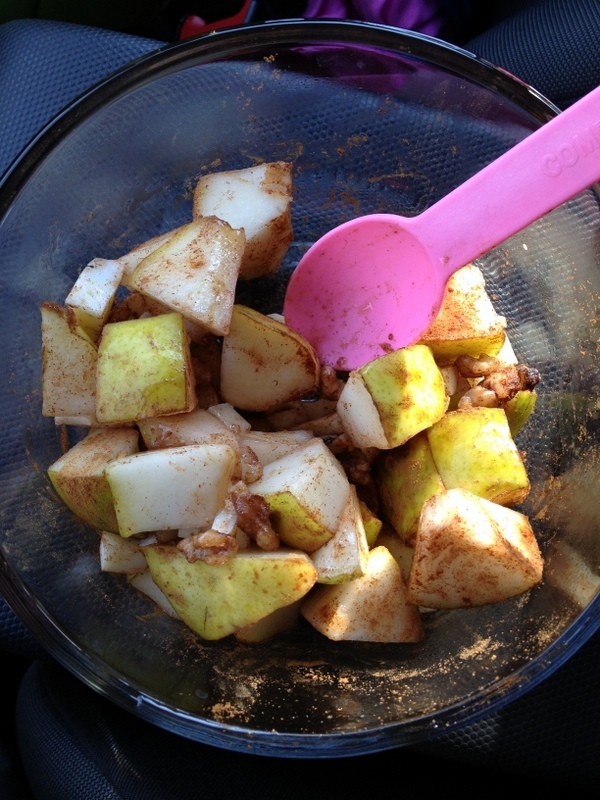 Lunch: diced pear with walnuts, fontina cheese, a sprinkle of cinnamon and a drizzle of honey. This would be a GREAT breakfast as well. 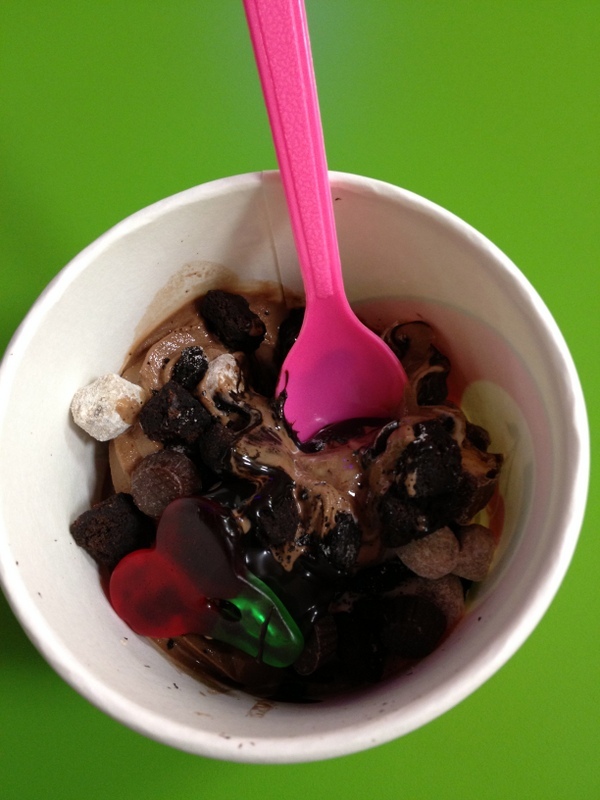 I also snacked on a couple of other fruits and veggies to hold me through the afternoon. After work I wanted to get movin’, but didn’t want to get sweaty because Dana and I had date plans for later in the evening, so I opted for a 40 minute walk on the treadmill. 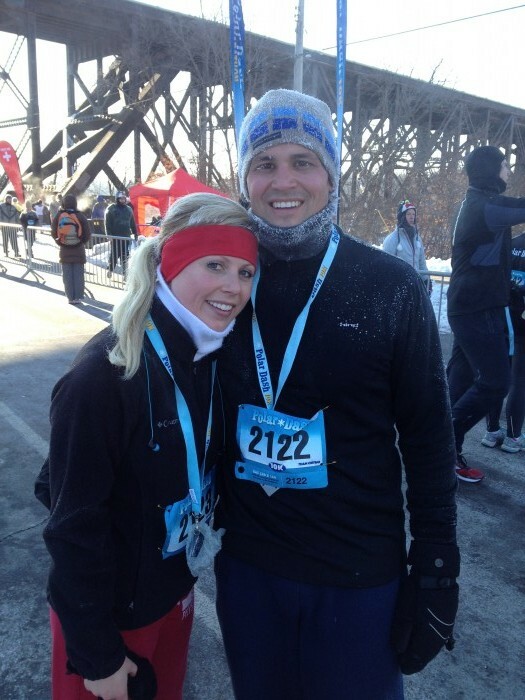 I kept a pretty easy speed the whole time while enjoying my favorite channel, Food Network. I really haven’t been in much of a cooking mood this week but we managed to throw together a pretty nice dinner considering. 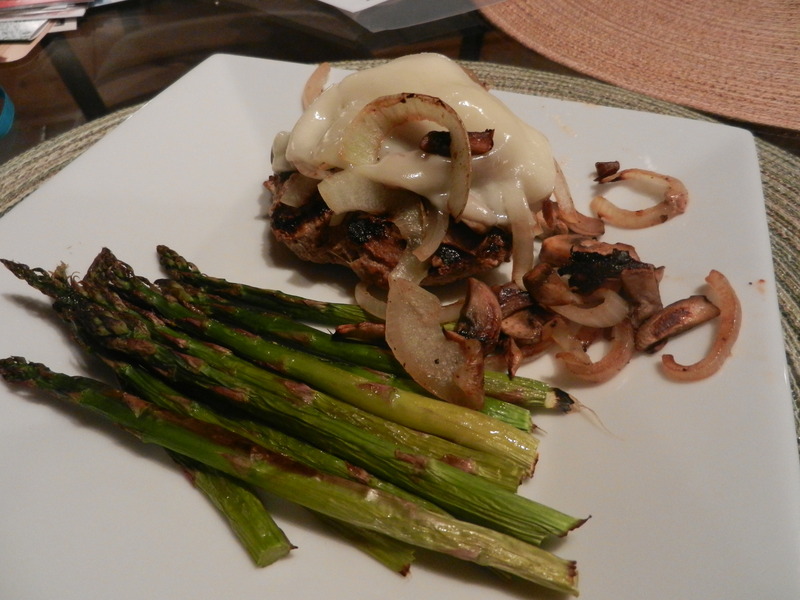 On the menu: turkey burgers seasoned with worcestershire, seasoned salt, and pepper topped with sautéed mushrooms and onions and melted fontina cheese, served alongside roasted asparagus. Now, on to date night. Next up, a whole lot of laughs. 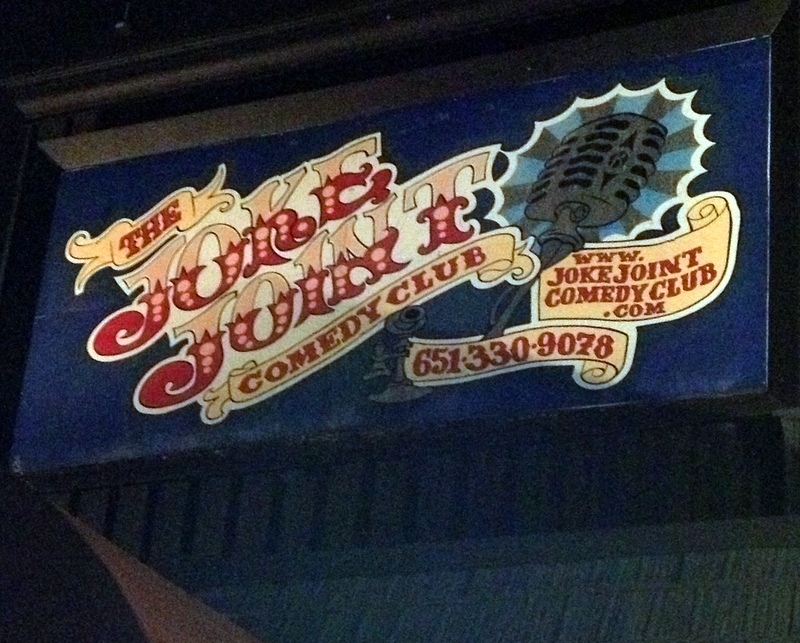 A while back we had bought a Living Social discount deal for a show at a comedy club called “The Joke Joint” which is a family owned business established just six years ago. As life gets so busy, our date nights become less and less, so buying the tickets in advance was a really good push for us to get out and do something fun, because if you know me at all you know I am not one to throw away money. The actual show room was very casual and intimate and kind of smelled like a really old home but in a welcoming sort of way. Is that weird? Dana and I were seated literally belly up to the stage. Our entertainers for the night were Geoff Tate and Chris Maddock. They were HILARIOUS. My cheeks hurt from laughing and I had perma-wrinkles around my eyes. It felt great. Laughter is the best medicine. I would absolutely recommend this place to family and friends that are in the area. Find a comedy club near you and get your laugh on! What a great weekend that went by all too fast as always. How about catching you up a bit from the last time we touched base which would be Saturday around lunch time. 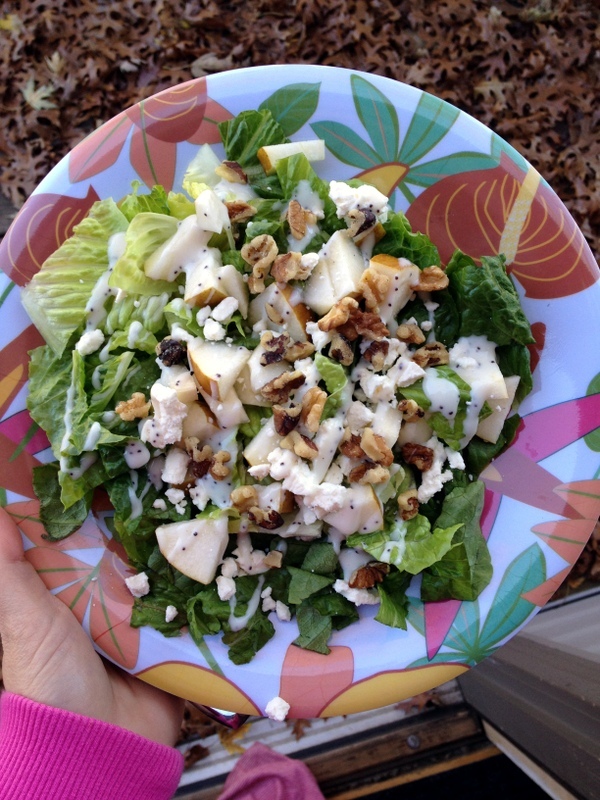 In my belly…a harvest pear salad with romaine lettuce, pears, walnuts, feta cheese, and poppy-seed dressing. Complete with fall leaves in the background of the photo. 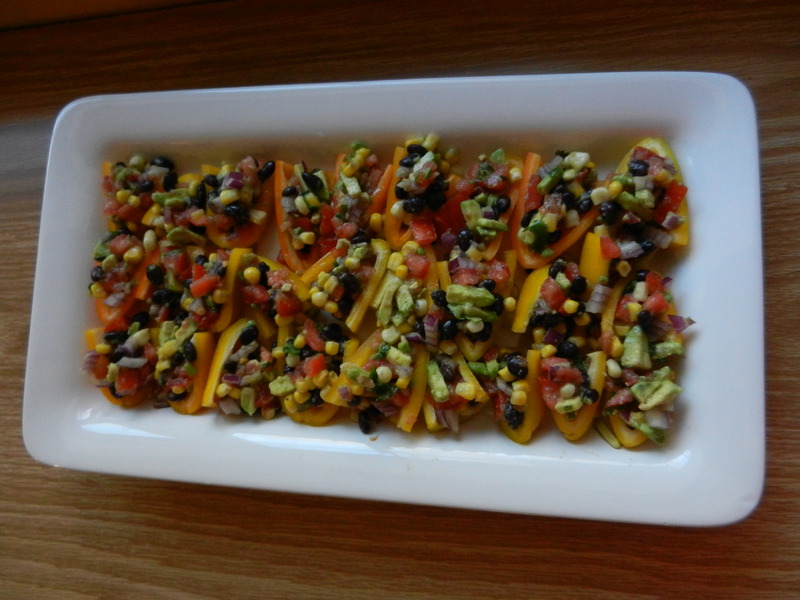 After lunch I got to work preparing an appetizer for a Halloween party we were going to that evening. I combined tomatoes, black beans, corn, avocado, red onion, cilantro, lime juice, cumin, garlic powder, salt and pepper to make a cowboy caviar. 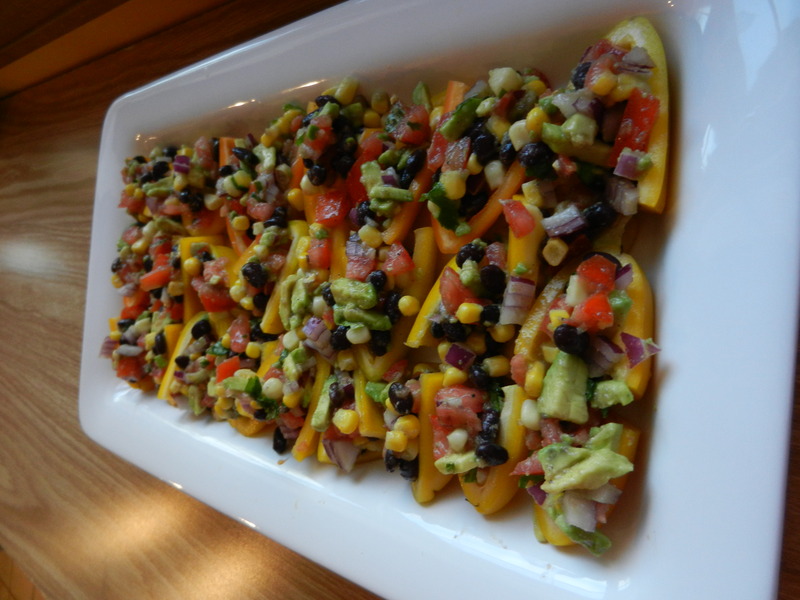 I then halved orange and yellow mini bell peppers, took out the seeds and the stem, and filled each boat with cowboy caviar. Delicious, healthy and beautiful to boot! To the Halloween part-ay we went. 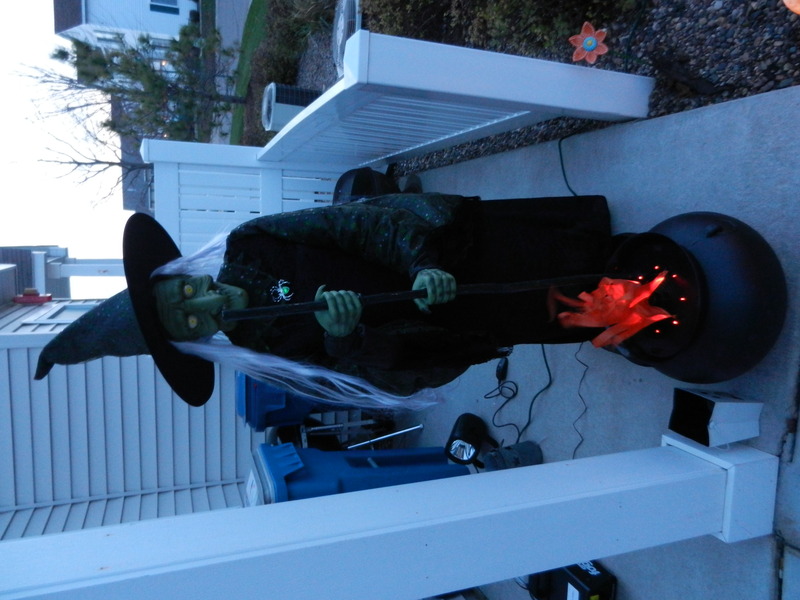 We were greeted by this beautiful witch brewing up a secret potion and making snarky remarks at us. Before I reveal what Dana and I dressed up as, let’s have a little fun and let me give you some hints and see if you can guess. I am holding our newest child Penelope. Our son Mason is at auntie Kimmy’s for the night. Any Kardashian fans out there? I was Kourtney Kardashian and Dana was her boyfriend Scott Disick. That’s alright if you didn’t get it, most of our friends didn’t know either. 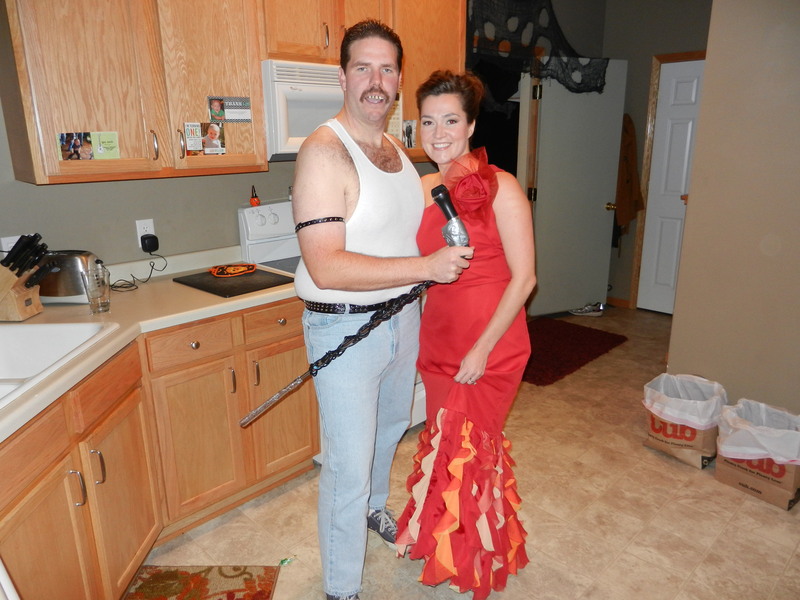 Our lovely hosts for the evening were Freddie Mercury (Adam) and Katniss (Stacy). 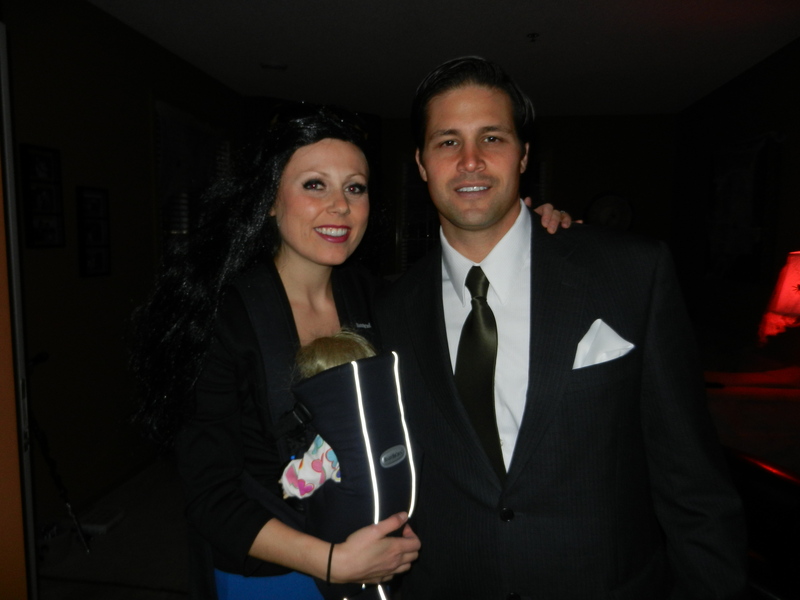 It made me feel better that I didn’t know who either of them were dressed up as either. It was a general theme for the night—no one knew who anyone was supposed to be. 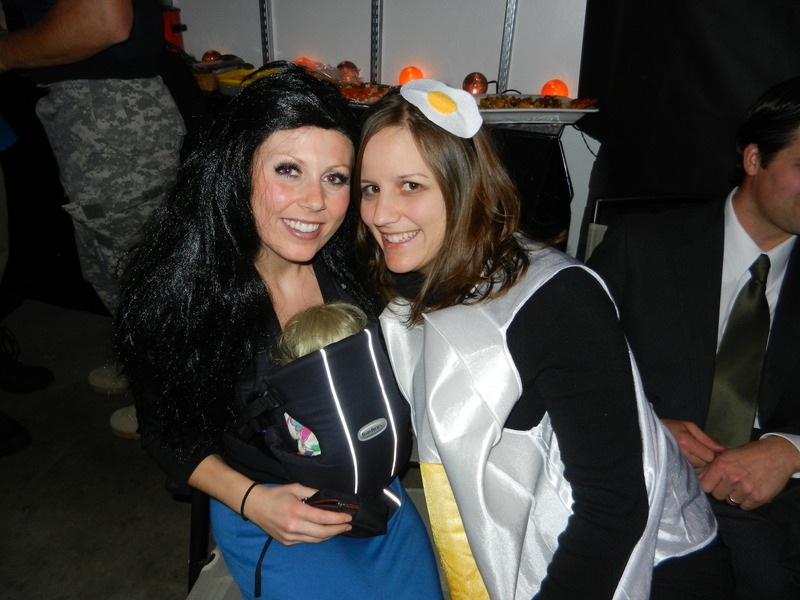 We had a great time as always being with our friends, munching on some great chow, and laughing at everyone’s ridiculous costumes. We were home and into bed by midnight and I was wide awake at 8:00 am Sunday morning. 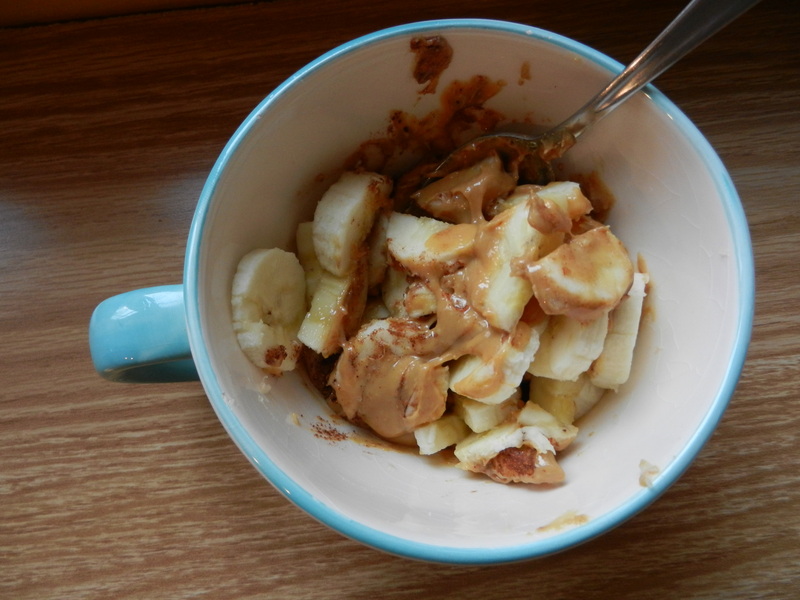 I made myself a chopped banana with Parkers Farm peanut butter and cinnamon. I also drank a cup of coffee while we flipped through the Sunday paper. Next, we hit the road for our grocery shopping extravaganza. We will be leaving for our vacation to Colombia in just a few days, but we needed to stock up the fridge for a very special guest who will be staying at our house with the pup. We got a late start on running our errands so by the time we got home it was 1:00 pm and we were both very hungry. I notice that’s a common theme around our house. 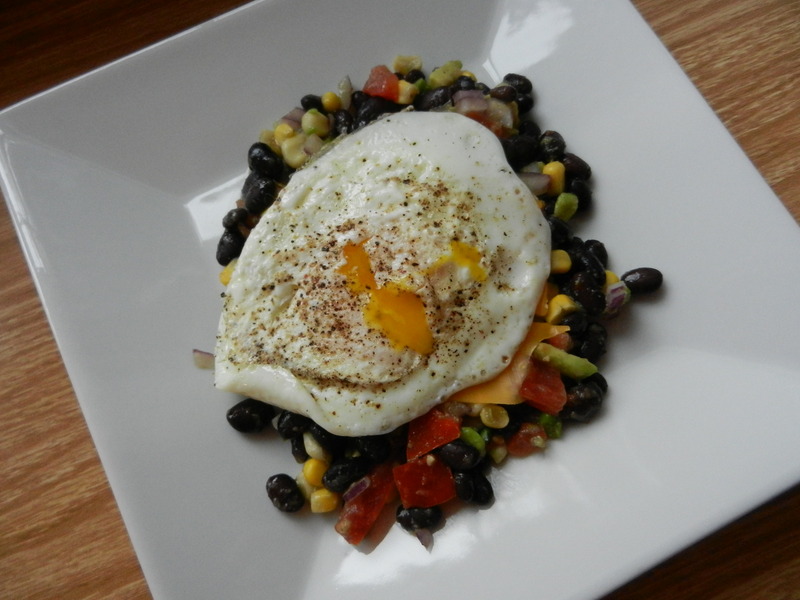 I was excited that I had leftover cowboy caviar from the appetizer on Saturday, so we cooked up a few over easy eggs, topped them on top the leftover cowboy caviar with some cheese, and had a protein packed and super tasty meal within minutes. In the afternoon I made myself change into workout clothes and took the dog out for 2.6 mile run around the neighborhood. I could tell I was tired and dehydrated because it was a pretty difficult run for me. A very good friend of mine was in town for the weekend so I got to see him and his beautiful girlfriend for a little while, then mom and dad stopped over too! After that we did a little packing and got ourselves ready for the week ahead. 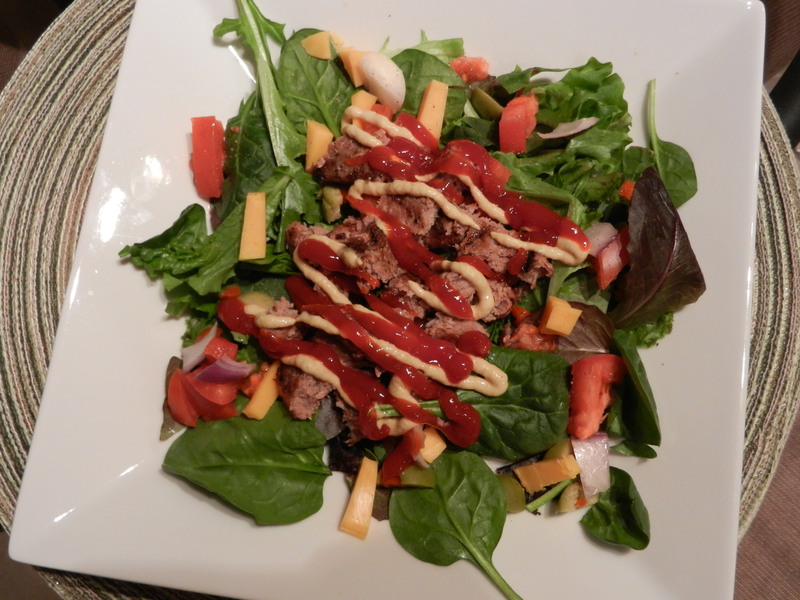 Oh and we ate dinner too…a turkey burger served on top of a salad with onion, tomato, cheese, and green olives. 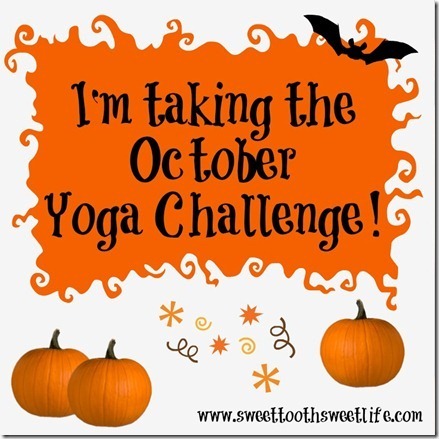 Since it’s Monday that means it’s time to check in on the last October Yoga Challenge for the month! I can’t believe the month is over in a couple of days. I kind of feel like October didn’t happen it flew by so fast, but IT DID. Don’t let me fool you. This past week I got in not one, but two yoga sessions. The first one was a full body session and the second was a session geared towards athletes. I completed the whole month’s challenge using OnDemand yoga sessions. Once again, I loved every second of this challenge. Yoga is about connecting the body and the mind, and it is good for all of us to take the time to practice that. Whether or not you are lying on a yoga mat, or sitting in your office, take 30 seconds periodically to become aware of your mind and body. Focus on your breathing if you are feeling overwhelmed. Remind yourself to live in the moment. I said this before but I do truly mean it again, I really hope to continue to include yoga in my life even though this challenge comes to an end. I feel better after every session and it reminds me to stay calm and helps me to control stress. Thanks to Courtney for hosting this challenge once again!